Fat and Happy Food Blog Tips and Techniques: Eat shellfish in months ending in an 'R' (October, November, December...) Shellfish spawn in the summer months and were thought to be toxic. Many distributors now ship-in shellfish from cooler climate areas during these months, but I would suggest knowing where your food is coming from. Mince the shallots and the garlic. Cook the shallots in the olive oil over medium low heat until they begin to become translucent, about 5 minutes. Careful not to burn or char them. Add in the garlic and continue to cook another minute. Turn the heat to high, add in the wine and tequila and bring to a boil. Add in the mussels, in a single layer if possible and cover. Check the mussels after about 3-4 minutes. You want them all to be open. Cook another minute or two as needed. Turn off the heat, add in the parsley, the cilantro, the butter, the chipotle pepper and then squeeze 1/2 a lime over it all. Toss well and let sit with the cover on for another minute. 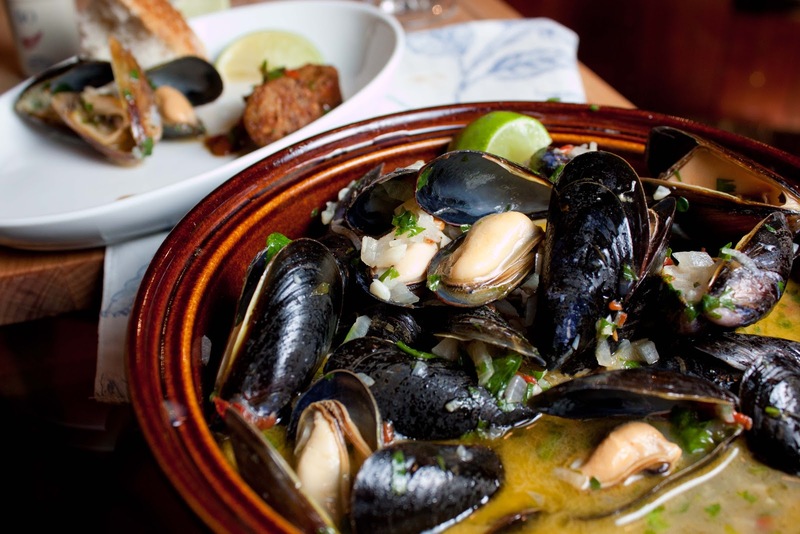 Pour the mussels and all the sauce into a bowl. Discard any mussels that did not open. 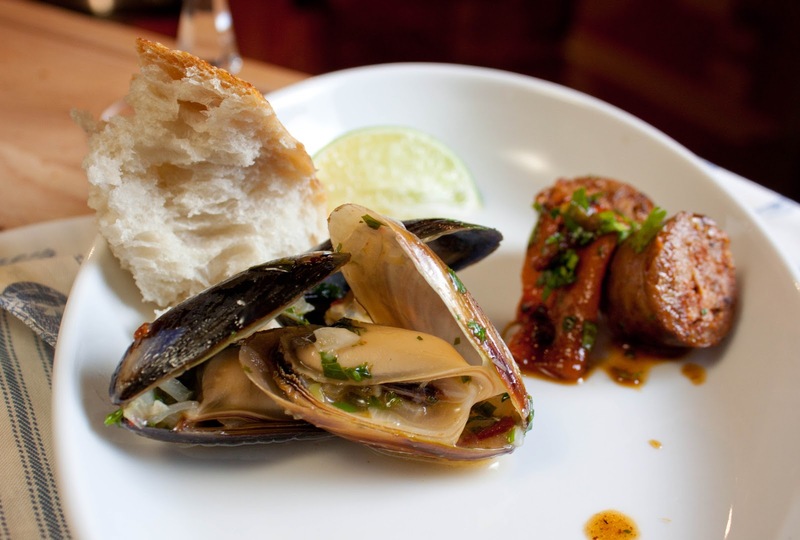 Cut the remaining 1/2 lime into wedges and add to the mussels. Serve with a crusty bread and an extra bowl to throw the shells in. In a medium-sized sauce pan, brown the sausages over medium high heat on each side. Add the sliced red onion and tablespoon of olive or canola oil. Reduce the heat, cover and cook until the onions begin to caramelize and the sausages are fully cooked, tossing often. Roast the pepper and scrape off the skin while the sausage is cooking if it's not roasted yet. Remove the sausages and let rest for 5 minutes. Slice the roasted pepper, add to the onions along with the minced garlic, toss well and cook for another minute. 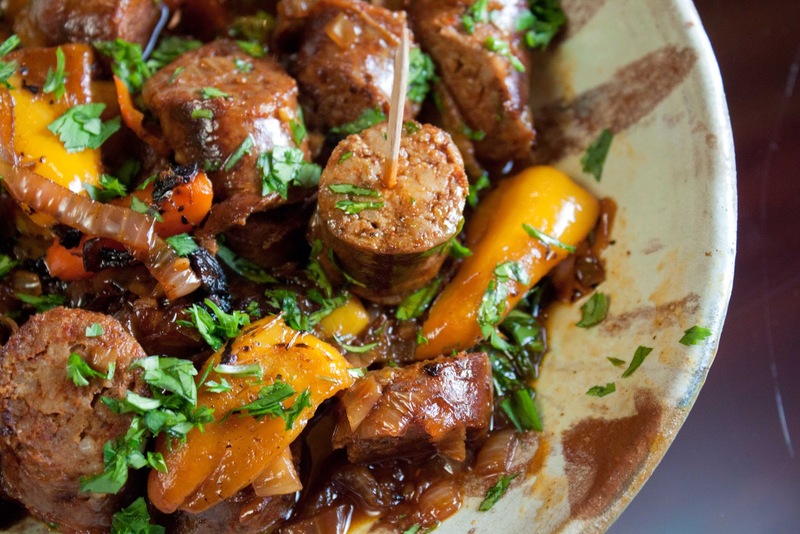 Slice the sausages, add the sausages and the wine to the onions, simmer for minute, cover and turn off the heat. Let rest until the mussels are ready. Pour into a dish and serve while warm with a crusty bread.